To demonstrate this, imagine that you have two bowls of exactly the same size that represent your life. One is full of rocks, and the other is mostly full of sand. The rocks are your major priorities -- family, friends, exercise, client work, etc. The grains of sand are all the little things you do that add up over the course of the day -- emails, errands, laundry, dishes, diapers, TV, etc. Your task is to combine the rocks and the sand into one container, to make sure you're getting everything you want out of life. However, if you put the sand in first, the rocks won't fit. You have to put the rocks in first, and then pour the sand around them. Most of us have this backwards. We have the major commitments and desires, but we let day-to-day life overwhelm and overtake us. We regularly and continually put the sand in first. The video below is old and, arguably, corny. But it demonstrates this principle so clearly that I had to include it. The first step is to identify your rocks -- your priorities. Then to add them to your schedule in such a way that they really ARE priorities. Then let your life fill in around them. As the video shows, it will anyway. You wouldn't know it just by looking at me, but I am currently on jury duty. Ok, well, not active jury duty. Standby jury duty. I have been assigned an attractive eight-digit number and am required to call an 800 number every night for two weeks to see if they need me to report the next day. Many people I tell say that this is so frustrating and awful, and, really, I see it as a win -- they could call me and require me to sit there every day for two weeks. So I called the Friday before I was due to serve and the friendly voice on the phone said that if the first three letters of my last name were "S-A-N" then I was to report to the federal courthouse in Brooklyn. I rolled up to the courthouse at about 8:25, as we were required under penalty of death and/or dismemberment to be there by 8:30. I checked in my mobile devices (both work and play) and headed upstairs with two, thick Philippa Gregory novels. 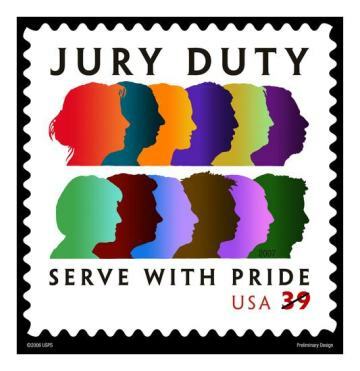 At around 9:15 a woman came out and gave us a very sneaky speech about how she knows everyone hates jury duty and it's not her fault so please don't yell at her and don't worry if you're in the bathroom when your name is called because they'll keep calling it. And then we waited. And read. And waited. And tested the theory about your name being called in the bathroom. I could go on for days about how thrilling it was, sitting in the overly air-conditioned room, waiting for something to happen, or how annoying it was to see Ms. Lateypants roll in around 10:30 and not get yelled at, but that's not my point. I had vacation coming up later that week (for July 4th) and I did NOT want to be at jury duty instead of on vacation. Miss work? Sure, no problem. Miss squishing my little nephews? Think again. At a certain point, people around me started freaking out about the fact that we were on a two-week standby. "I have a doctor's appointment." "I have to pick up my mother at the airport." "I have to travel for work." I wanted to stand up and scream, "I HAVE TO GO ON VACATION!" but thought maybe that was inappropriate. I came up with a plan: if I was called for Thursday, I would tell them I had a doctor's appointment and couldn't be there. I was ready with the details of my extravagant lie -- I was seeing Dr. Tyler Andrews* in Connecticut who was an endocrinologist (apparently they're very hard to get appointments with -- who knew?). I was starting to get antsy and panicky, when I realized there was nothing I could do about whether or not they called me. I would just have to burn that bridge when I got there. So I just waited. I called Monday night to see if they needed me Tuesday -- nope. I called Tuesday night to see if I would have to schedule that appointment, but no, they didn't need me. Thursday night I called, and they didn't need me Friday, either. The feds taught me that sometimes it's not worth stressing about something you can't control. Have a plan, be open and ready for what you don't want, and then Let. It. Go. Sitting there (like Mr. Chattypants in the back of the room) worrying and fuming about whether or not I'd have to give up my vacation was just going to a) be annoying and b) cause me stress it turns out I wouldn't need to feel. "Isn't that the whole point?" a friend of mine recently asked me. "You realize there are things you can't control and then you just don't bother trying to control them." Jury duty is just one of those things.